A sparkling gem column represents the seven chakras in Satya Scainetti's 18-karat gold-dipped necklace. What if your chakras were actually made of gemstones? You'd be a walking rainbow. Satya Scainetti's sparkling gold chakra lineup is a wearable version of that divine idea. 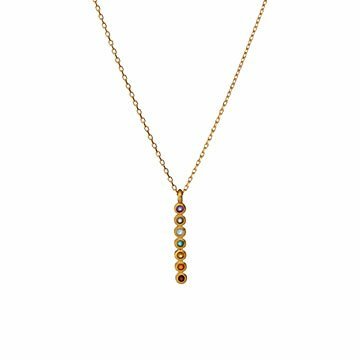 She handcrafts the elegant necklace from 18-karat gold-dipped brass, aligning the rainbow of gems (amethyst, blue agate, blue topaz, green onyx, citrine, carnelian, and red garnet) in a vertical pendant. A beautiful gift for fans of Eastern philosophy and wellness traditions, it elegantly reminds the wearer to stay true to their intentions no matter where the day takes them. Handmade in Thailand. Pendant: .04" L x .91" W Chain: 18"
My sister showed it to her guests at her birthday party and said everybody was admiring the necklace, especially the sparkling chain. I only saw it the catalog. I live in Minnesota and she lives in San Diego so I haven't seen it yet. My first order from Uncommon Goods and I am so happy she loved the gift. Such a pretty piece of jewelry!